[247 Pages Report] In this study, 2015 has been considered as the base year for estimating the market size. 2021 is considered as mid-term and 2026 as long-term forecast years. The global roofing adhesives market was valued at USD 3.91 Billion in 2015, and is projected to reach USD 5.78 Billion by 2021 at a CAGR of 6.75% from 2016 to 2021. 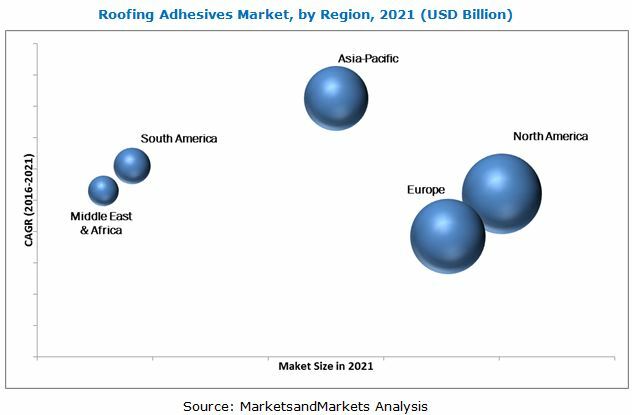 This report aims to estimate the market size and future growth potential of the roofing adhesives market across different segments such as resin type, technology, application, and region. 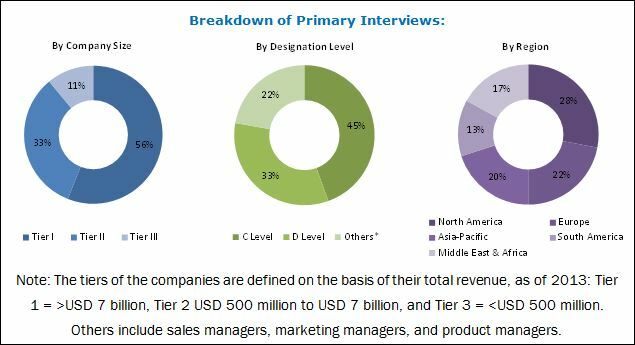 Factors influencing the market growth such as drivers, restraints, opportunities, industry-specific challenges, and opportunities in the market for stakeholders and competitive landscape in the market are presented in the report. Top-down and bottom-up approaches have been used to estimate and validate the size of the global market and to estimate the sizes of various other dependent submarkets in the roofing adhesives market. The research study involved the use of extensive secondary sources, directories, and databases such as Hoovers, Bloomberg, Chemical Weekly, Factiva, EPDM Roofing Association (ERA), National Federation of Roofing Contractors (NFRC), British Adhesives & Sealants Association (BASA), Asphalt Roofing Manufacturers Association (ARMA), Building Envelope Industry Associations, and other government and private & company websites to identify and collect information useful for the technical, market-oriented, and commercial study of the global roofing adhesives market. After arriving at the overall market size, the total market has been split into several segments and subsegments. The figure given below provides a breakdown of primary interviews conducted during the research study. The value chain of the roofing adhesives market starts with the sourcing of basic raw materials. The basic raw materials used in the manufacturing of roofing adhesives are PU, epoxy, silicone, acrylic, and others. These raw materials are used by different roofing adhesives manufacturers, such as The 3M Company (U.S.), The Dow Chemical Company (U.S.), Henkel AG & Company (Germany), Sika AG (Switzerland), Arkema (France), and GAF Materials Corporation (U.S.). This research report categorizes the global roofing adhesives market on the basis of resin type, technology, application, and region. The global roofing adhesives market is projected to reach USD 5.78 Billion by 2021 in the midterm, at a CAGR of 6.75% from 2016 to 2021. This market is projected in the long term to be USD 8.01 Billion by 2026. This growth is driven by growing middle class population in emerging countries such as China, India, and Brazil. Increasing demand of elastic bonding adhesives from construction application to avoid cracks, provide chemical, oil and grease resistance, and higher durability has also increased the demand for roofing adhesives. In 2015, the residential construction segment accounted for the largest market share, in terms of volume, followed by non-residential/commercial construction. Rising income levels, shift towards nuclear families, affordable interest rates, and modern attitudes to home ownership in several countries expecting several new construction activities are driving the roofing adhesives market. Polyurethane is currently the dominant segment in the overall roofing adhesives market, however, the epoxy resin segment is projected to grow at the highest CAGR between 2016 and 2026. Epoxy resins have a unique combination of adhesion, chemical resistance, and physical properties. Epoxies are also used as structural glue. Materials like wood, concrete and others that are 'low-tech' are glued with epoxy resin. These properties increases the demand for epoxy resins in building & construction application. The Asia-Pacific market is expected to witness the highest growth rate, in terms of value and volume, between 2016-2021 and 2026. Asia-Pacific is the fastest-growing region for the global roofing adhesives market and this growth is mainly attributed to the rising demand of residential, commercial, and infrastructural activities in the emerging countries, such as Thailand, Indonesia, Taiwan, and Vietnam. This is driving the roofing adhesives market in the region. Though the roofing adhesives market is growing, few factors act as bottleneck toward the growth of roofing adhesives in the global market. Volatility in raw material prices is the major restraint to the growth of the market. Companies such as The 3M Company (U.S.), The Dow Chemical Company (U.S.), Henkel AG & Company (Germany), Sika AG (Switzerland), Arkema (France), and GAF Materials Corporation (U.S.) are the dominant market players in the global roofing adhesives market. Diverse product portfolio and strategically positioned R&D centers, continuous adoption of development strategies, and technological advancements are a few factors strengthening the market position of these companies in the roofing adhesives market. They have been adopting various organic and inorganic growth strategies to enhance their current market share for roofing adhesives. 5.3.3.2 Economic Growth and Rising Government Expenditure on Infrastructure Development.